Drinking water safety for communities with lead water lines has been a common topic of discussion ever since the whole Flint water crisis happened. 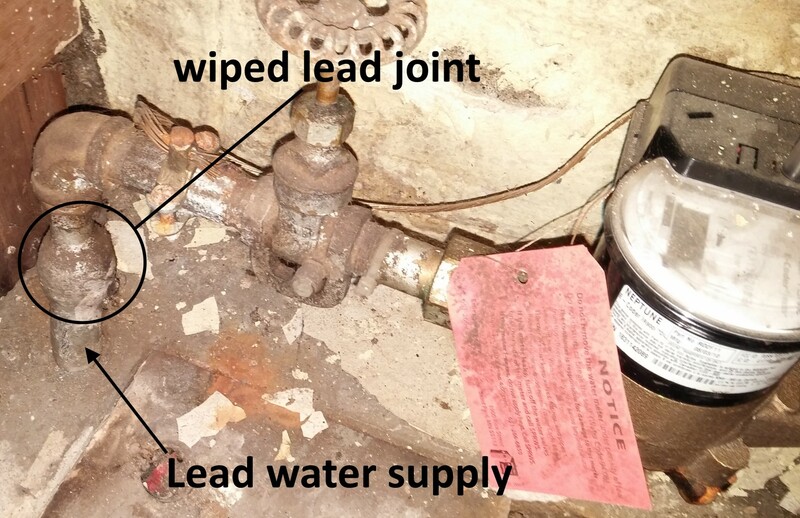 This is a topic that is brought up during home inspections as well, and was just discussed and blogged about on NPR recently, so I thought I’d throw in a home inspector’s two cents on the whole topic of lead water lines. Lead can get into drinking water through plumbing fixtures and soldered joints that contain lead, but the biggest potential source of lead contamination to drinking water is through lead water supply lines. These are the water lines running throughout the city, often from the city water pipes directly into homes, typically entering basements up through the floor. The two cities in Minnesota where I commonly find lead water supply lines coming directly into homes are Minneapolis and Saint Paul. As mentioned in a previous blog post, lead water supply lines can be found in Minneapolis homes built before 1932, and in Saint Paul homes built before 1926. I don’t have historical information for other cities. Both ASHI and InterNACHI standards of practice* require home inspectors to inspect the interior water supply systems. Whether or not this means that home inspectors are responsible for inspecting the small stub of water piping that comes into the home isn’t clear, but I don’t think it really matters. The reason it doesn’t matter is because both the ASHI and InterNACHI standards of practice specifically exclude the identification of environmental hazards, such as the presence of lead water lines. I repeat: home inspection standards don’t require home inspectors to report on lead. Nevertheless, most home inspectors can quickly identify the presence of lead water piping, often from across the room. The first indicator that you may have lead piping is the presence of something called a “wiped joint”, which is a big swollen ball of lead that can always be found at the transition between lead piping and other types of piping. Be aware, however, that these wiped joints can also be found on copper tubing, so it’s not a guarantee that you have lead piping. To know for sure, try lightly scratching the piping with a screwdriver or even your fingernail. Lead piping has a dull finish, but any scratched areas will be shiny. Click on the photo below to see a larger version, which will make the shiny scratches easier to see. * Side note: I only mentioned two home inspection standards of practice because the third large organization for home inspectors, NAHI, recently closed their doors. All NAHI members are now members of ASHI. 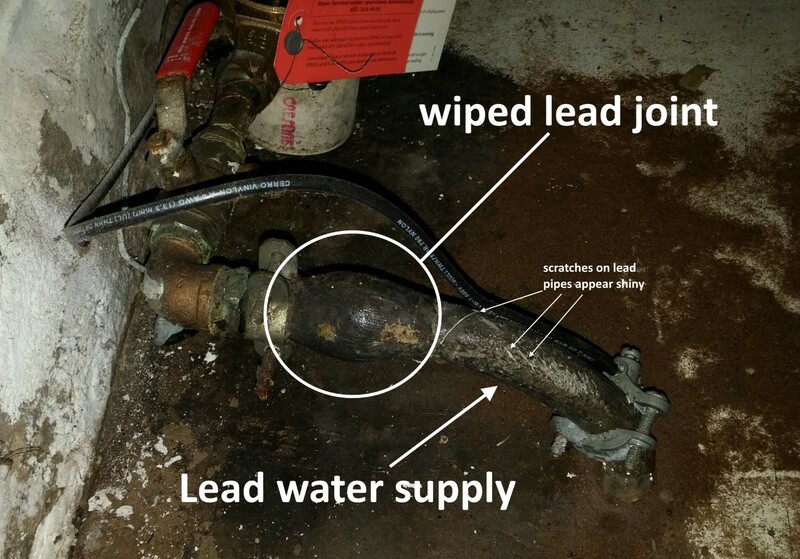 If my home inspection standard of practice does not require me to report on the presence of lead water piping, does this mean I ignore it when I see it? Heck no. Not when it can be so easily identified. When anyone at my company finds lead water piping, we identify its presence in our inspection reports and we tell our clients to do their own research on the topic of lead water lines. I don’t want to be the one to say whether or not lead water piping is safe, because frankly, I don’t know for sure. I used to think vermiculite insulation was safe if tested and found to contain less than 1% asbestos, but I don’t think so anymore. Replace the lead water lines. Replacing the lead water supply lines is expensive, and it’s the homeowner who pays for it, but this probably offers the highest degree of protection against lead. Don’t drink the water. If you choose to not drink the water, you’ll need to buy your water. The least expensive method would be to refill your own containers. Drink the water. There are numerous steps that can be taken to minimize your exposure to lead, many of which are listed in this document from the city of Saint Paul, Keeping Lead Out. Even if the visible portion of the water supply piping coming into the home is copper, it’s not a guarantee that the home has copper water piping all the way out to the street. In many cases, the water piping has been replaced out to the curb stop (typically located near the curb), but NOT all the way out to the city trunk, which might be located across the street. To know which side of the street the city main is on, look for which side of the street the fire hydrants are located on. To know for sure what type of piping is run all the way out to the main, contact the municipal water department. They keep records of that stuff.